The credit of the invention of the wheels is given to the Mesopotamian era but the idea of riding by means of pedalling finally met its full development in the Victorian Era. (The nineteenth century). Real progress concerning a practical vehicle was accomplished in 1816. It was in that year that the father of the bicycle, German-born Baron Karl von Drais, invented the draisine or dandy horse as it was called. It is noteworthy that this invention had the front wheel that pivoted and there was a handlebar for steering. Made in 1865, the two-wheeled riding machine made entirely of wood was the first to have pedals applied directly to the front wheel. Designed and named by a Frenchman, Lallement, it became the first real bicycle. Later, this model was given iron tires and, because it was ridden on the cobblestone roads of the day, it was aptly named the boneshaker. By 1870, ingenious high wheel models, such as the first all-metal bicycles appeared with solid rubber tires and long spokes. One of the bicycles of that period was called the Ordinary. Gradually, its front wheel was enlarged for a smoother ride, and the rear wheel reduced for speed. It eventually had a 40-48 inch front wheel for farther travel and a 16-inch rear wheel. One high wheeler even had a front wheel of 64 inches. The phrase, taking a header was coined when the rider was stumbled by a sudden necessity to stop and fell forward to the ground landing on his head. But this risk didn’t stop anyone. Even the women in their long dresses and tight corsets wanted to get in on the fun. They were riding around on another invention, the high wheel adult tricycle. This mechanical version also became popular with the more dignified gents who were doctors and clergymen. By the 1880s, the two wheeler (bicycle) was tremendously popular, especially with the younger men who had the money to pay for it. In 1878, the Columbia an American bicycle appeared on the market; and in 1889, an Irishman named Dunlop patented his bicycle, which had tires made from a rubber hose. Likewise, Tillinghast patented the bicycle with a hollow tire. This introduction with an air-filled (pneumatic) tire made riding very enjoyable. In the 80s and 90s, everyone rode and the bicycle built for two (and four) arrived. With everyone riding, safety became a primary factor, and many mechanical innovations such as rack and pinion steering, band brakes, the differential and steel tube frames, and wheels came into being. Speed was the secondary factor. It was a practical investment for men and women as a means of transportation and saving time. It surely beat the two-legged shuffle. 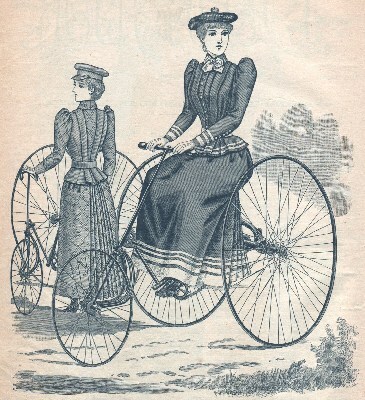 This new found craze put an end to the corset and bustles once and for all yet, interestingly, the bicycle is still with us. This interesting invention contributed greatly towards the development of the transportation aspect of advancement.